Ah, perfectly put. As I begin my 30th year as a professional business owner, I am embarking on a new, small, minuscule, “unimportant” business. I put it that way so when it blows up I won’t feel too badly. 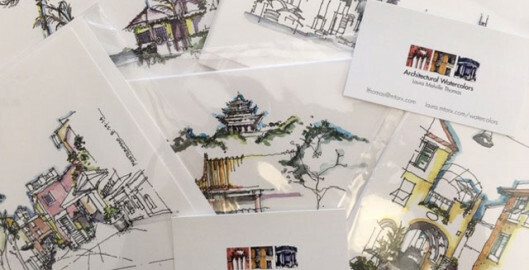 As many of you might know, I have finally launched a new online store for my watercolors. E-commerce!! I have written before about how I sketch and where I sketch. And even a bit of why I sketch. I sketch for me. Not to sell and never for one minute did I think that this would ever make any money. Yet year after year, there were those who knew what I was doing who asked for a few notecards or suggested a collection-type mini book. So I did that. Truly, my wonderful CFO here at my architectural firm would look at the watercolor expenditures versus the income and could barely keep from rolling her eyes. Understood. So, logically, if I would just tell a few more people, let a few more people know about the watercolors, if I would just sell and market, I might sell a few more. True that. But, wait…Then I would have to put it out there. I would have to expose myself and my art and what if… they are no good? Alas, there it is. The imposter syndrome. So instead, courage. Begin. All my life’s lessons, again. Whomever you are, reading this essay- GO! RUN! to this Watercolors website- she is NO impostor, and her work is lovely. You will want…no, NEED these beauties!